love her and a past filled with pain and regret. 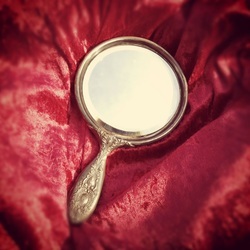 a treasured mirror she had received at birth. the one she’s always known, or the Kingdom of Light. With the help of the warrior known as the One and Only, the kind and wise Counselor, and even the Almighty One, Kamea must decide whether to believe the haunted reflection of her long trusted mirror, or what those in the Kingdom of Light tell her is true about herself. Kamea is a story about how our identity is transformed when we come to know Christ. It is designed to arouse curiosity as to what the Bible really says about us and therefore includes over 200 Bible references that are footnoted throughout the text. The Journey Guide is a Companion Bible Study that enables us to join Kamea on her Journey.